GCA Altium acted as exclusive financial advisor to Silverfleet Capital, the Pan-European private equity firm that specialises in buy-to-build, on its acquisition of a 100% stake in Pumpenfabrik Wangen GmbH ("Wangen"), a leading designer and manufacturer of high quality progressing cavity and twin-screw pumps, from the company’s individual private shareholders. GCA Altium provided Silverfleet with both M&A and debt advice on the transaction. Founded in 1969 and based in Wangen im Allgäu, Germany, Wangen is a market leader in the manufacture of screw pumps that are suitable for highly viscous or abrasive substances as well as solid-fluid composites. The company offers a broad range of standard as well as customised pumps designed and manufactured in-house for specific uses. Wangen has an international distribution network, supplying clients including the Royal Navy, Schwarzkopf and the Wirtgen Group. The company, which employs around 200 people, currently manufactures products for the four key end markets biogas, food & beverage, agriculture and wastewater treatment. Wangen’s focus on product innovation has led to several recent new product launches, including a highly sophisticated twin-screw pump technology that is primarily used in the food sector, as well as other hygienic applications such as cosmetics and pharmaceuticals. 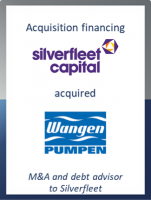 Silverfleet Capital’s investment will enable Wangen to continue to grow internationally, further penetrate the company’s key end markets with new product portfolios, as well as diversify across industries using Wangen’s leading technologies and product innovation capabilities. As part of the acquisition, Silverfleet Capital has assembled a high quality and experienced management team who will be responsible for executing Wangen’s international growth strategy. Klaus Maurer, Partner at Silverfleet Capital, said: "Wangen is a clear market leader with a strong product base and R&D focus, operating in an attractive market. We are excited by the prospect of working closely with the management team and using our experience in the sector to help grow the company internationally and enable Wangen to achieve its full potential." Completion is subject to regulatory approval and the terms of the transaction were not disclosed.